(Nanowerk News) How can we store solar energy for period when the sun doesn't shine? One solution is to convert it into hydrogen through water electrolysis. 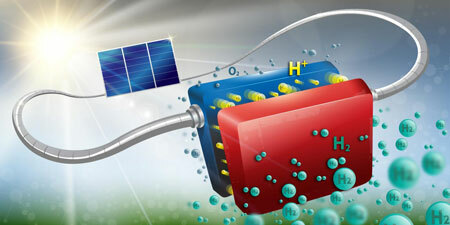 The idea is to use the electrical current produced by a solar panel to 'split' water molecules into hydrogen and oxygen. Clean hydrogen can then be stored away for future use to produce electricity on demand, or even as a fuel. But this is where things get complicated. Even though different hydrogen-production technologies have given us promising results in the lab, they are still too unstable or expensive and need to be further developed to use on a commercial and large scale. The approach taken by EPFL and CSEM researchers is to combine components that have already proven effective in industry in order to develop a robust and effective system. Their prototype is made up of three interconnected, new-generation, crystalline silicon solar cells attached to an electrolysis system that does not rely on rare metals. The device is able to convert solar energy into hydrogen at a rate of 14.2%, and has already been run for more than 100 hours straight under test conditions. In terms of performance, this is a world record for silicon solar cells and for hydrogen production without using rare metals. It also offers a high level of stability. The method, which surpasses previous efforts in terms of stability, performance, lifespan and cost efficiency, is published in the Journal of The Electrochemical Society ("Solar-to-Hydrogen Production at 14.2% Efficiency with Silicon Photovoltaics and Earth-Abundant Electrocatalysts"). "A 12-14 m2 system installed in Switzerland would allow the generation and storage of enough hydrogen to power a fuel cell car over 10,000 km every year", says Christophe Ballif, who co-authored the paper. The key here is making the most of existing components, and using a 'hybrid' type of crystalline-silicon solar cell based on heterojunction technology. The researchers' sandwich structure - using layers of crystalline silicon and amorphous silicon - allows for higher voltages. And this means that just three of these cells, interconnected, can already generate an almost ideal voltage for electrolysis to occur. The electrochemical part of the process requires a catalyst made from nickel, which is widely available. "With conventional crystalline silicon cells, we would have to link up four cells to get the same voltage," says co-author Miguel Modestino at EPFL. "So that's the strength of this method." The new system is unique when it comes to cost, performance and lifespan. "We wanted to develop a high performance system that can work under current conditions," says Jan-Willem Schüttauf, a researcher at CSEM and co-author of the paper. "The heterojunction cells that we use belong to the family of crystalline silicon cells, which alone account for about 90% of the solar panel market. It is a well-known and robust technology whose lifespan exceeds 25 years. And it also happens to cover the south side of the CSEM building in Neuchâtel." The researchers used standard heterojunction cells to prove the concept; by using the best cells of that type, they would expect to achieve a performance above 16%.